We had breakfast at our hotel, Riad Ossagou. We had thick warm pita bread and crepes with almond butter, jam, and fresh mountain honey. I also had some olives, which Bryan can’t stand. We washed it all down with orange juice. Bryan had a nasty instant Nescafe—I just couldn’t do it. Our hotel was basic but clean and the owner and manager were extremely helpful and kind. The first evening we were there the owner sat down with us and shared mint tea and talked. 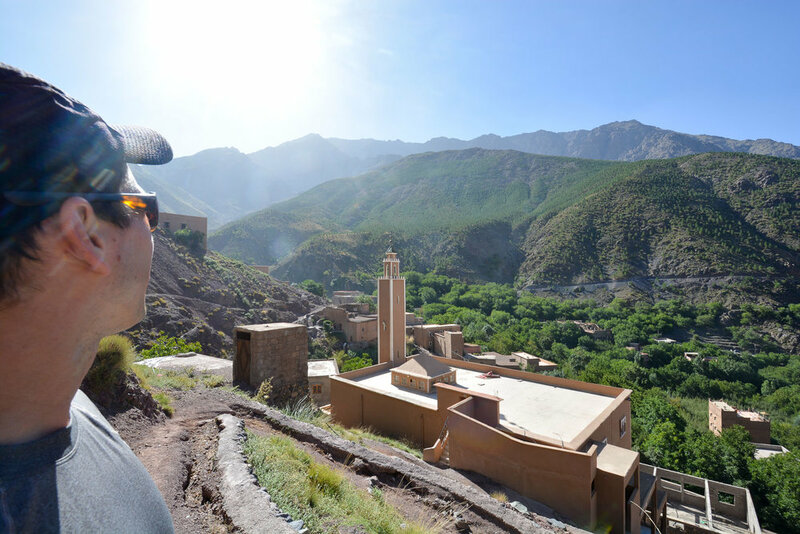 He told us he had been a hiking guide around the Atlas mountain area for 12 years. When we asked him why he had stopped, he told us it had been hard on his knees and when his children were born he decided to save his knees so he could play with his children. That’s when he went into the hotel business. 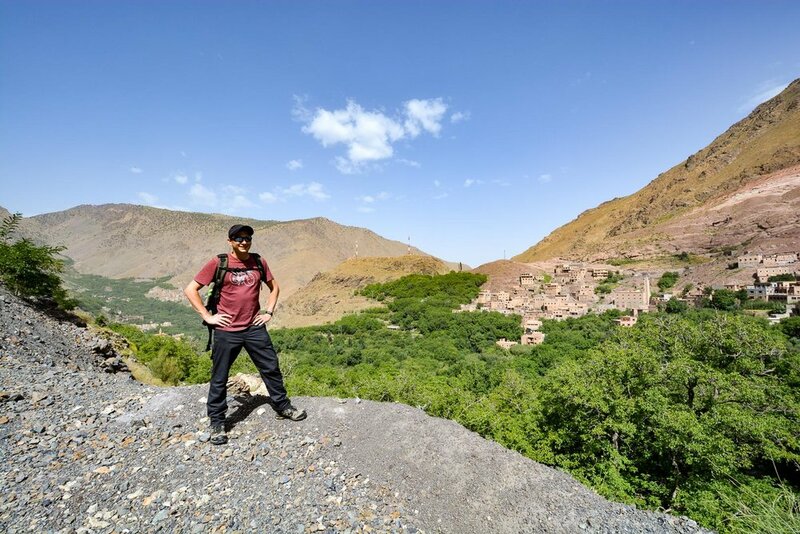 He knew the best guides in the area though, so we booked a 3-day trek around the Atlas mountains through him. The manager and cook, Mohommad (It seems like 50% of the men in Morocco has this name…), made all of our dinners in Imlil. We loved his cooking, and everyone we talked to seemed to in town gushed about how wonderful a cook he was. I’m not sure how he did it all because he also managed the hotel. Before we headed out for the day we asked him for directions. He gave us detailed instructions, repeating himself several times, and even drew us a diagram in the dirt. We still weren’t 100% sure what he said because his broken English, but we went for it anyways. 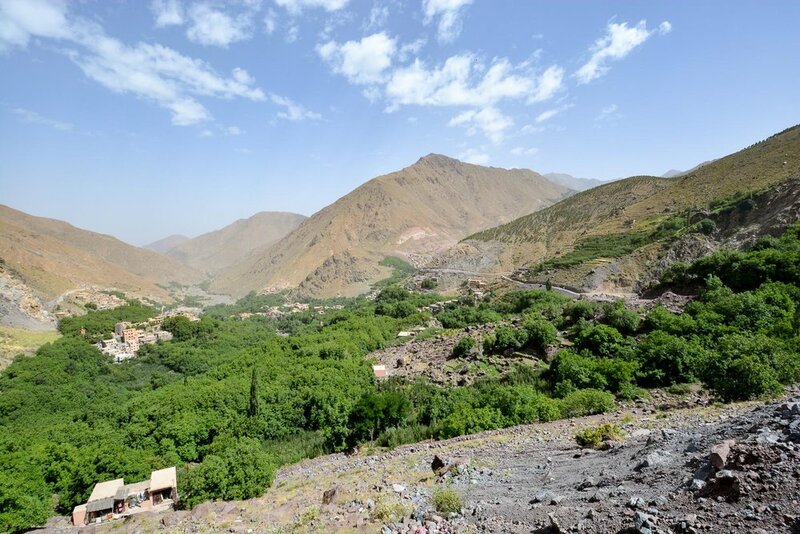 We started hiking up the mountain towards the highest village in Morocco. On the way there we passed by a large mountain spring cascading down the mountain. Next to it was the aftermath of a rockslide—a pile of rocks almost completely blocking the path. The path ran along the edge of a cliff and the only part the rocks hadn’t blocked was right next to the edge of the cliff, leaving the path as wide as 2 boots next to each other. 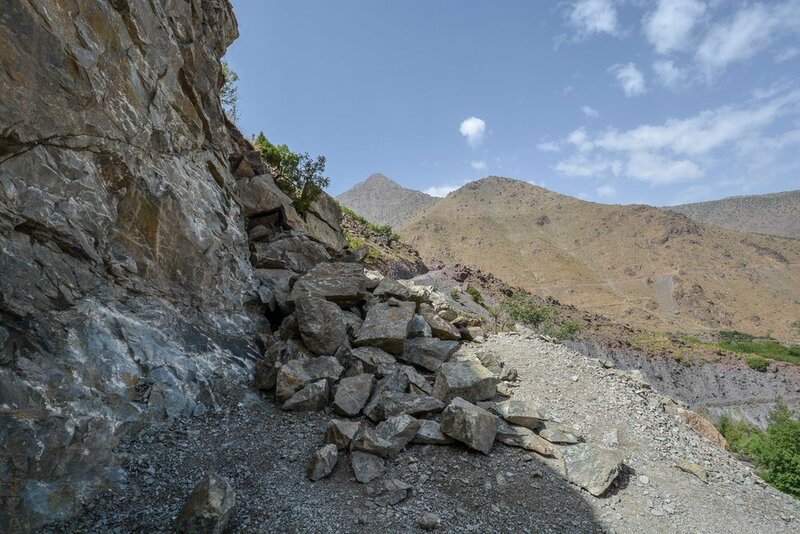 We carefully traversed this and then walked to the highest village in all of Morocco and bought a water. We descended to the valley through which a river was flowing. We followed a very confusing path that paralleled the river. The path kept splitting into various directions and if you chose the wrong one, you would dead end either at a stream crossing or a puddle of slippery mud. A few locals caught us going the wrong way and pointed us in the right direction. After 20 minutes of hiking through the valley cafes started popping up. 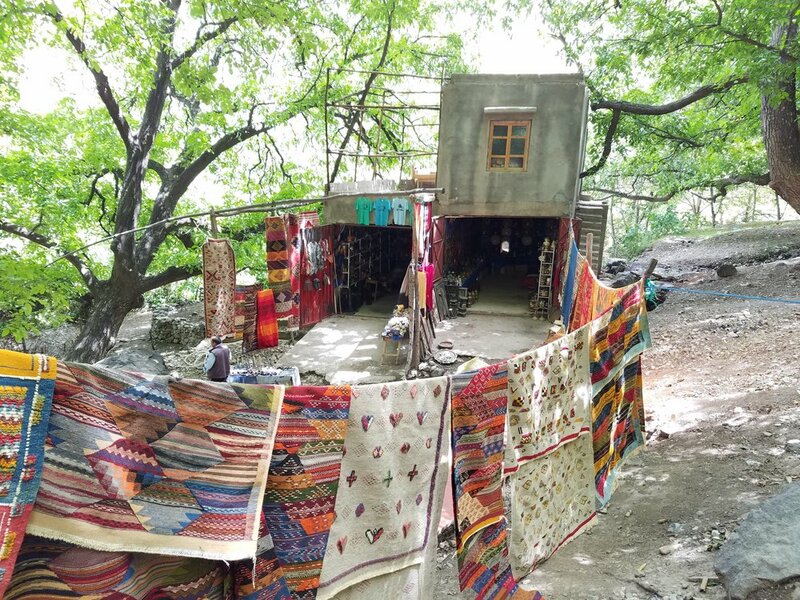 These cafes were precariously built on the edges of rocks, and some even had patios built for extra seating! At the village we saw some cliff side construction! 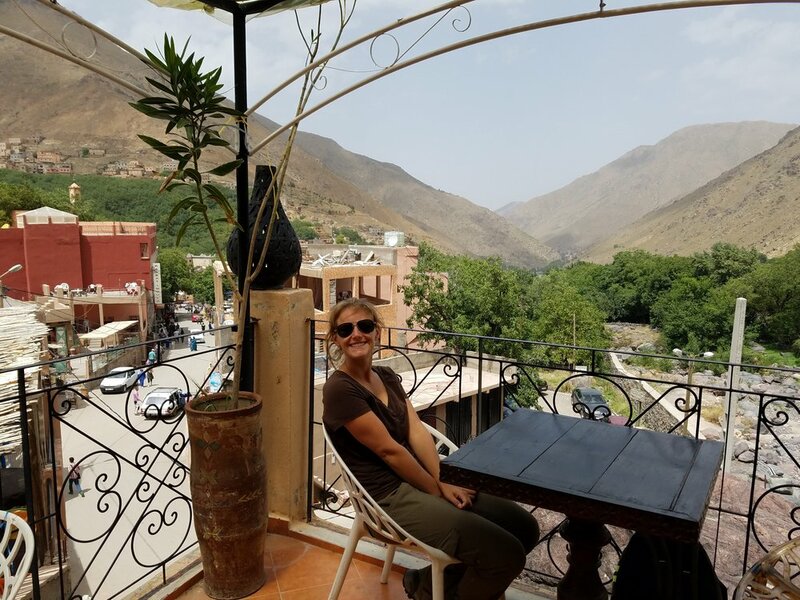 Some of these cafes were better described as tagine stations where many gas burners were lined up in a row and different types of tagines were bubbling away. Families were hauling huge baskets filled to the brim with picnic supplies up and down the steep path. I saw one woman setting up her family’s picnic area. She was setting up her own gas burner; she was going to make sure her family had a hot meal for lunch! We climbed up and down along the path, then around a bend and crossed a barely put together bridge. Then we came upon two waterfalls cascading into pools. The pools were filled with women, men, and children wading in the icy cold water. A few brave people let the waterfall completely drench them. Everyone looked like they were having a blast. One little girl saw us at the waterfall and kept speaking to us, but we couldn’t understand her. She just giggled when we shook our heads in confusion. She then tried to tickle Bryan! He didn’t know what to do, so she turned her attention to me and grabbed my hand and led us towards the waterfall. Some people braving the icy water! We said goodbye to the little girl and continued down the trail and descended into a sparse forest. We passed by people selling spices and nuts. One large shop was filled to the brim with everything you could imagine—it was like an open-air Bed, Bath, & Beyond. We talked to the shop owner for a bit, and he told us he doesn’t only sell his goods for money, but he will trade us for something. He then pointed down to his hiking boots and told us he traded a tourist some things for the boots! We saw many tourists riding donkeys and mules up the mountain. We continued down and saw the little girl again, this time she was following her mother. The little girl saw us and walked behind us, so we ended up walking between her and her mother. She was behind us yelling something we didn’t understand what she was saying, but her mother turned around with a “stop being so annoying” look on her face, so I imagine it wasn’t anything good. The mother was surprised to see we were right behind her and not her child. The girl then skipped past us to her mother, and gave us a mischievous smile. I stuck my tongue out at her as she passed by in response, and she laughed. The shop that has everything! We ate lunch at a cafe in Imlil on a rooftop. We ordered a vegetable tagine and mint tea. The complimentary bread seemed like the outside was stale, and the mint tea was so bitter we couldn’t finish it. The tagine was surprisingly good though. We paid and left. We wandered the entire town in 20 minutes, and then Bryan suggested we get popsicles. We went by a freezer he had seen with popsicles in them, and guess who was also there? The little girl and her mother again! As soon as she saw us buying popsicles, she tugged on her mom’s dress and begged for a popsicle. Her mom came over and bought a popsicle for her, and she was all smiles. We laughed and said goodbye to them. My overall impression of the town was—meh. 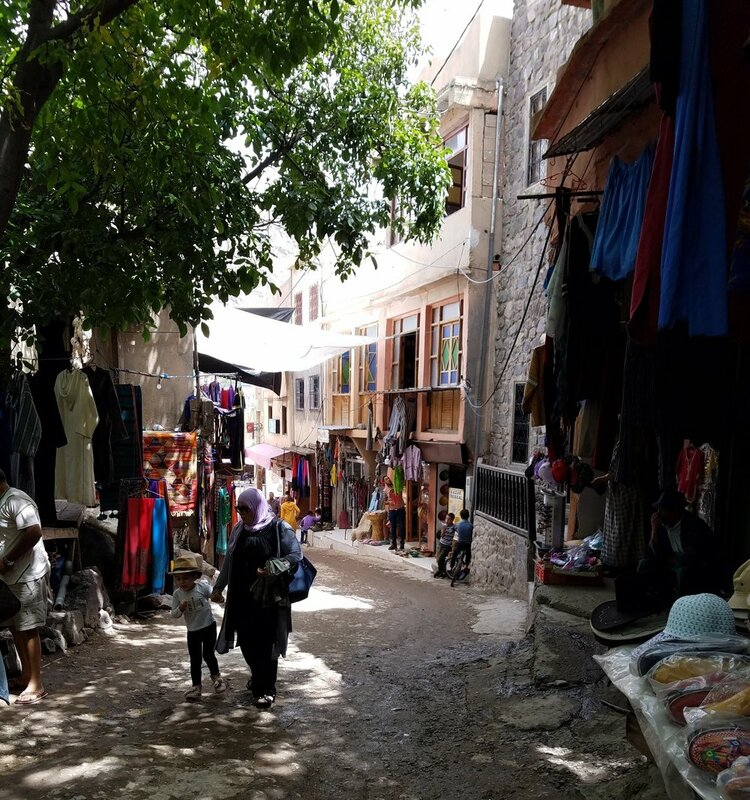 I had read it was supposed to be a place where we were not bothered, but we were constantly asked by owners to see their shops, eat at their restaurants, and one guy had the nerve to walk around with us for 5 minutes trying to convince us to buy a bracelet from his purse. He tried 3 different times, begging us to buy it, but we declined each time. I don’t know why he wasted his time after the first time I said no. That night we had another amazing meal prepared by Mohommad—harira soup, vegetable tagine, bread, yogurt and oranges. Today we checked out of our hotel. 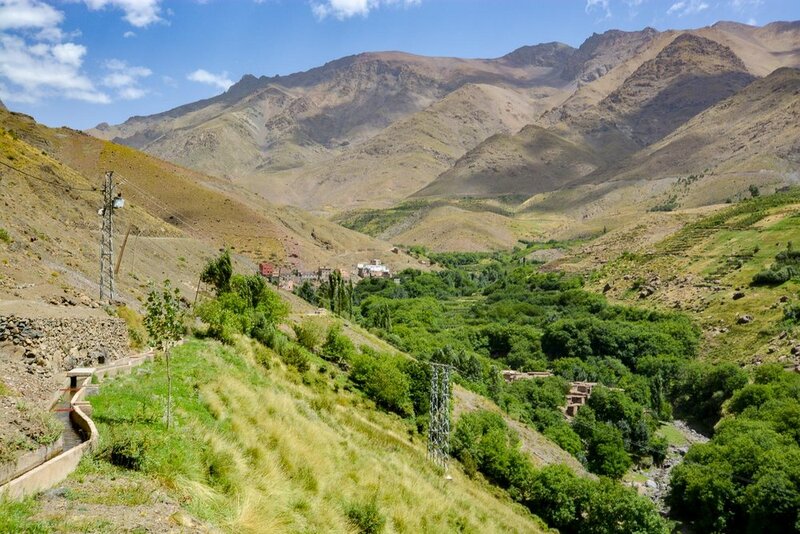 We started our 3-day, 2-night trek through the Atlas Mountains. Our guide’s name was Ali, an older gentleman who has been guiding people on treks for 27 years. Every village we passed by today he talked and shook hands with at least a dozen people. Our cook’s name is Mohommad (different one than at our hotel), and he didn’t go on the trails with us. Instead, he led a mule with our backpack and his cooking supplies on the road. 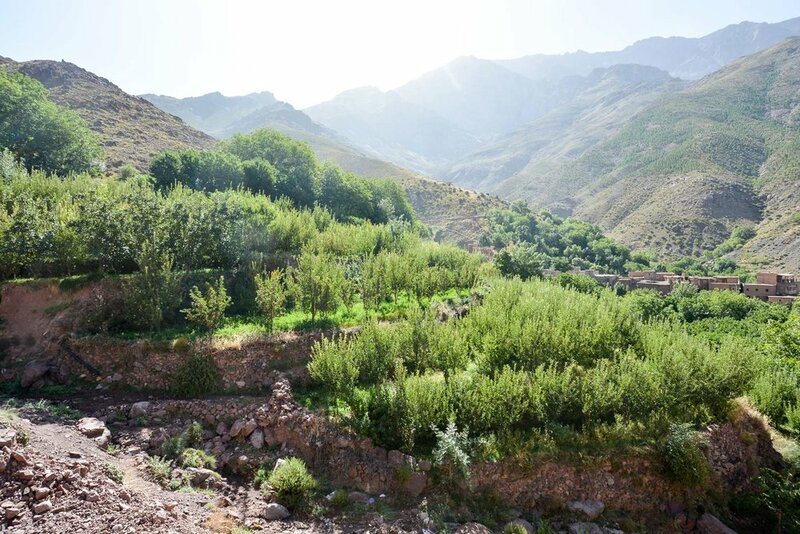 We started by walking down into the valley near Imlil to an elevation of 1740 meters, where apples, cherries, and walnuts are grown. 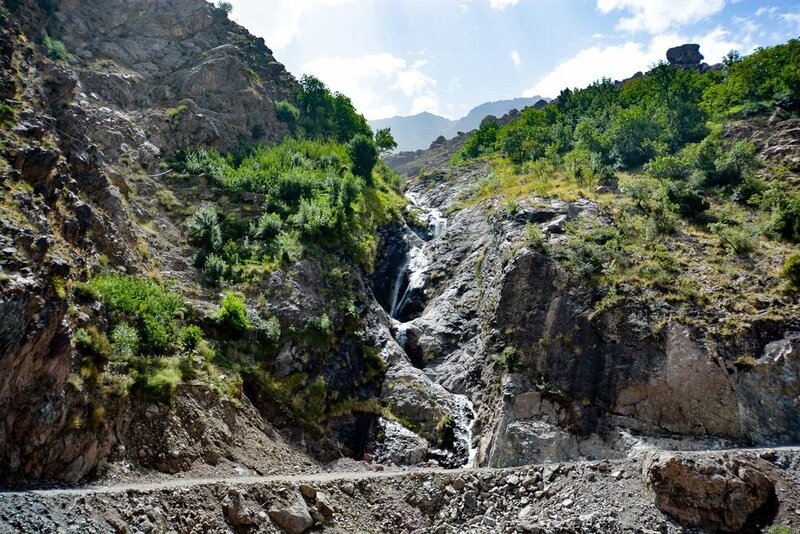 We then ascended the mountain opposite of Imlil climbing to the mountain pass. 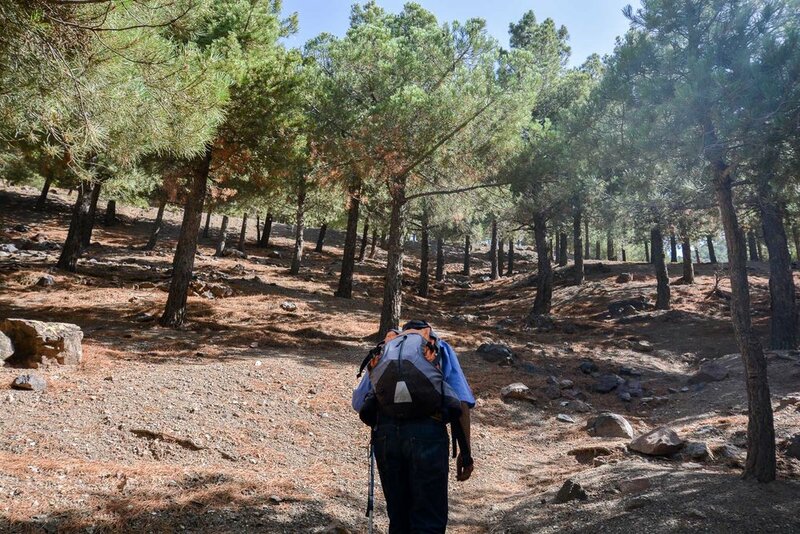 As we continued to climb, we passed pine forests where trees seemed perfectly spaced from each other. We learned they were planted in the 1960s to prevent avalanches and erosion. 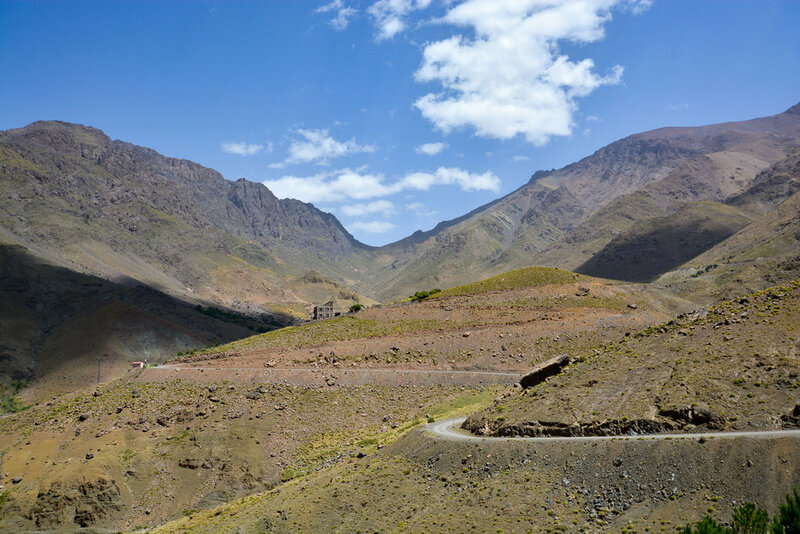 We arrived at the mountain pass, Tizi n’Tamterte (elevation of 2300 meters) where we had lunch prepared by Mohommad at a makeshift restaurant in literally the only building on the mountain pass. Our guide, Ali—he’s got the skinny arm pose down! The greenish yellow rock is actually copper! While there, we saw another group hiking. One of the couples were speaking English with an American accent, and we said hello to them. It turns out they’re currently living in NYC, and their names were Kara and Peter (weird because we have two friends also named Kara and Peter who got married this past spring!). It turns out Kara graduated from UVA in 2010! Part of me really wanted to sing out the Good Ol’ Song, but I just went with a heart “Wahoowa!” instead. What a weird coincidence in the middle of nowhere Morocco. After lunch, we walked along the mountain 3 more hours. 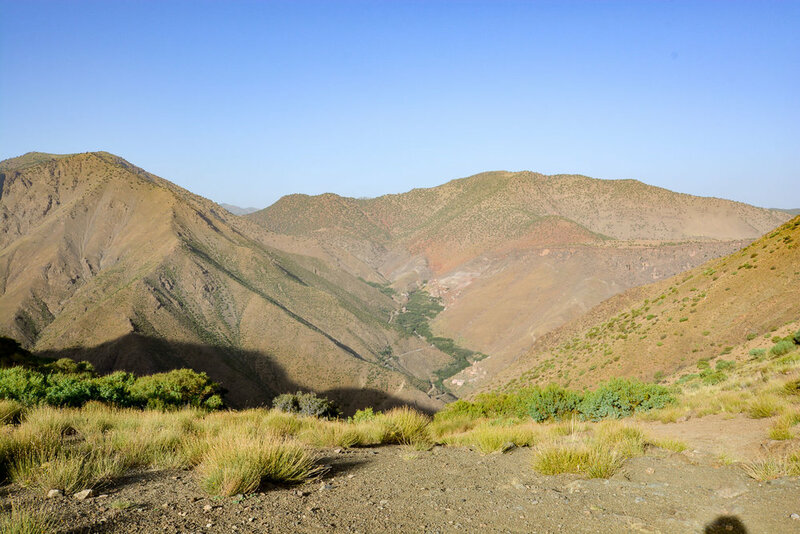 We passed by springs, lush valleys, dusty mountainsides, and few more villages until we arrived at the Berber village of Tinghourine. As we approached the village from the other side of the valley, we could hear music and cheering. Ali said tomorrow a marathon running event was being held in the village. 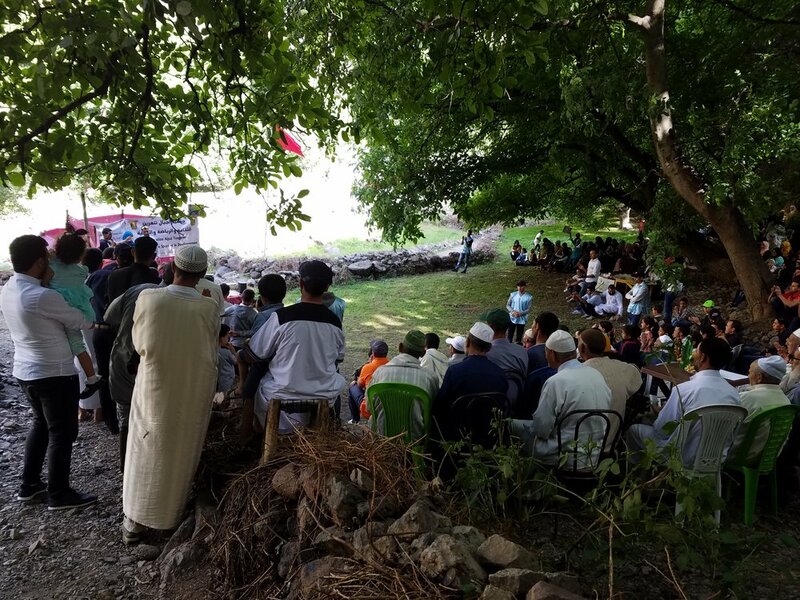 When we arrived in town it seemed like the entire village was gathered in an expansive clearing sitting in chairs and standing on the sides facing a stage made from cinderblocks and wood with curtains surrounding it. We were offered mint tea (aka Berber whiskey). Everyone was staring at us. Many warmly greeted Ali. We then left the celebration and walked through the celebration and walked through the Berber village which was rustically built. We stayed at a guesthouse, which was very basic and somewhat clean. We showered in a dingy outhouse concrete structure (it has a porcelain toilet though!). We then relaxed a bit with mint tea, a nut & raisin mix, and digestive biscuits. Afterwards, Ali led us down to the celebration. We found out they were actually gathering to honor students’ achievements in sports! I loved how the entire town came together to cheer every student awarded—boys and girls alike. Around us, the call to prayer began, and Ali said he was going, so we went back to the guesthouse to journal and eat dinner. Ali served us dinner of…harira soup, bread, and… vegetable tagine!!! The soup was bland, but we both had 2 bowls anyways because we were so hungry. The tagine was very flavorful. Dessert was vanilla yogurt and fresh chamomile tea. Bryan and I played some games and waited for Ali to come back from prayer. When Ali came back, he asked if we’d like to go back to the clearing and see some music being played. We enthusiastically said yes. At the clearing there was a group of boys and men at the back of the clearing, which was built up about a foot higher than the rest of the area. They were around a fire with hand drums. They were putting the edges of the hand drums on the fire. Ali said it was to stretch and tighten the drumheads across the drum. Bryan and I stood under a tree nearby. Apparently only men are allowed on this elevated area, so Ali had advised us to stand nearby. The group started drumming, clapping, and singing. Then they started rotating in a circle. The song was sung faster and faster until it finally ended. The boys dragged Ali up and he drummed during the next song. They then dragged Bryan up for another song. Finally, they motioned for me to come over, and I asked if it was okay. One of the men said to me, “If you enjoy Berber music you are allowed.” Bryana nd I joined the circle clapping. We got pulled into the center to dance too, and one guy put his pillbox cap on Bryan. Some of the boys laughed at us stumbling through the songs, but we were having too much fun to care. We sang, clapped, and danced for a few more songs before going back to the guesthouse for the night. The second day was the longest hiking day. We woke up early and had a simple breakfast. For the first 2 hours of hiking, we ascended on the other side of the valley and climbed up to our first mountain pass of the day. 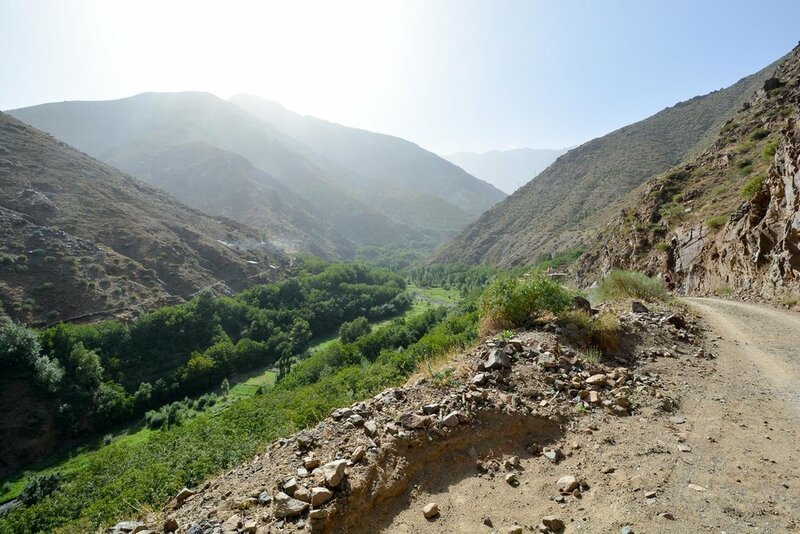 The landscape was mostly dry desert, but in the distance, we could see villages carved on the side of the mountains with lush terraces descending down from the houses into the valley below. About an hour into our hike I noticed our water bottle had barely any water left. I asked Ali if we would get a chance to fill up our water bottle that day, and he said no. I asked him again in a different way just in case he had not understood my English, but again he said no. I immediately decided to conserve how much water I drank. Bryan didn’t. He kept taking large gulps of water. Seriously, if you’re ever on a desert island with Bryan with only a few supplies, don’t leave him in charge of water and food. It will disappear rapidly. Luckily, we would get a chance to restore our water reserves later that morning! We then descended for an hour into another valley and by the time we reached the bottom we were out of water. We spotted Mohammad riding the mule down the road. We waved to him. He met up with us just as we reached a small restaurant with a store and outdoor seating by the river. We sat down with Ali for a few minutes and had some mint tea. The man who ran the restaurant came over and talked to us. He had lived in Paris for 15 years. When I asked him why he had moved away, he simply pointed back towards the restaurant and said, “My house.” The house on top of the restaurant was very large and looked quite lavish for the area we were drinking tea in. There was a woman cleaning on one of the balconies and calling out to passers-by and having quick chats with them. Ali did the same thing. He was quite the social butterfly. He would often stop and socialize with whomever he knew and whatever village we were passing by. I was so relieved we could buy water at the restaurant! We bought 4 waters and gave 2 to Mohommad to pack on the mule. Then we set off again. The second pass of the day was intense. We had the largest change in vertical elevation that day. The mountain pass teased us the entire way up too. I remember Ali pointing out a house that looked like it was on top of the pass and telling us it was keeping goats. When we finally reached the house, more of the mountain was revealed and it was clear we were not at the top yet. We climbed for another hour, and I could feel myself getting hungrier—er HANGRIER—by the minute. After one more “tease” of summiting the pass, we finally could see the true top and reached it shortly after. Mohommad was already there waiting for us. He had set up a picnic area for us, but as with every place he would pick out for picnics over the next few days, Ali disagreed. They bickered like an old married couple, except with a few friendly punches thrown in. It would always end in them laughing and Mohammad moving the picnic blanket to where Ali wanted it. The pass had many trees that resembled short and stumpy cedars. The picnic blanket Bryan and I ate lunch on was in the shade of one of the stumpy cedar trees. Lunch was delicious, and we almost ate every bit of it, which was unusual for us. You see Mohommad always cooked giant portions of food for us—like enough to serve a family of four or five people. It consisted of fresh salad with oranges, lentil tagine, bread, and an entire melon for dessert. Then it was nap time! Everyone dozed off for a half hour or so, but I still had some energy left in me, so I climbed the tree overhanging our picnic area. After naps we descended into the valley. It was about another 2-3 hours of descent along loose gravel. 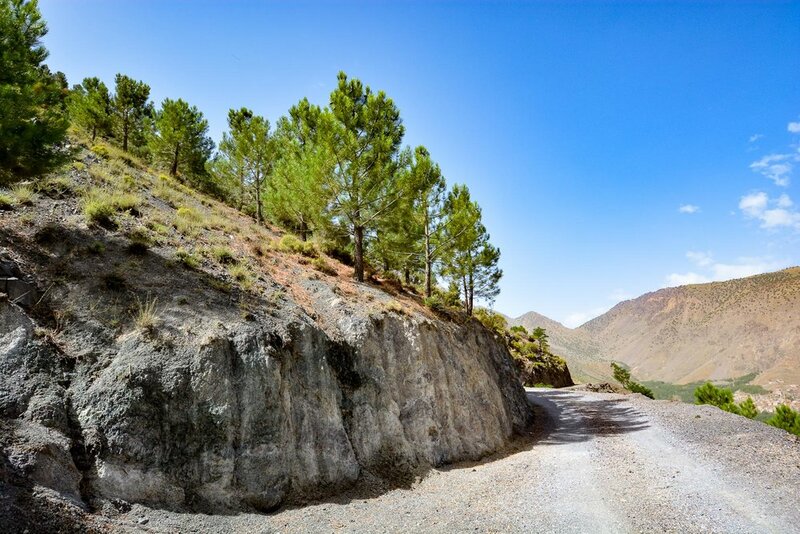 We passed through forests, dry, desert, abandoned villages, and a red mountainside. It took me a lot longer to descend because I was constantly trying not to slide down the steep path of loose gravel that would naturally slip on a little bit with each step. Now to go back down the other side! As we neared an extremely gorgeous valley, Ali told us we would be staying at a hotel there for the night. He then disappeared for a bit. We had caught up with Mohammad and the mule, so we walked a little while with him. Ali came running up to us with a partially full bottle of ice cold water. Mohommad mixed the cold water with our bottle of lukewarm water—it wasn’t until that evening that we realized Ali had not bought the cold water bottle from a store like we had thought, but rather he had filled up a bottle with spring water. If you know anything about traveling to Morocco, you would know not to drink tap water, or even spring water. We had drank about a half liter of the spring water. We both had some stomach issues (to say the least) that evening. Our accommodations for our second night was supposed to be a hotel. When we arrived at the hotel, we both laughed at the thought of our moms spending the night here. It didn’t look like a classic hotel we know. It was more like a dingy cinderblock house that was falling apart by the minute. 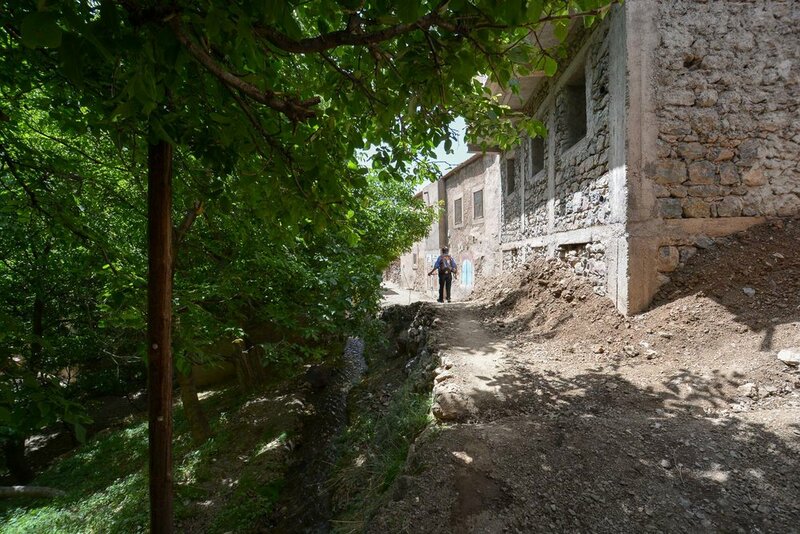 The 2nd floor was completely unfinished with a terrace overlooking the valley. Our room was filled with twin mattress pads on the floor covered in old blankets. Our pillows were clearly decorative as they were so stuffed and hard, they didn’t mold to our heads at all. The hotel had a nice poster taped to the wall of waterfalls from who knows where. The owner sat down at the table with Ali, Mohammad, Bryan and I for some tea, bread, and Argan oil. That evening the dinner was almost unbearable for me. My stomach was upset, and my appetite was nonexistent. The soup that night was watered down oatmeal and the meal was extremely bland couscous, unseasoned cooked vegetables on top, and a “sauce” to dip everything in, which was really just vegetable broth. I could barely eat it. I was just not feeling well at all and wanted to go to bed. The last day was by far the toughest for me. It was about as much distance as the second day, but I was not feeling well, so it took a lot of mental strength to get through the hiking. Breakfast was less soupy porridge and bread. I think supplies must have been running low haha. About a half hour into our hike, Ali stopped and told us we could go right and take a side trip to the waterfall which would add about 2 hours to our day or go left and skip the waterfall. I looked at Bryan, and he said either was fine with him. I wanted to see the waterfall, so we went right. I struggled through the entire day, but it was worth it! 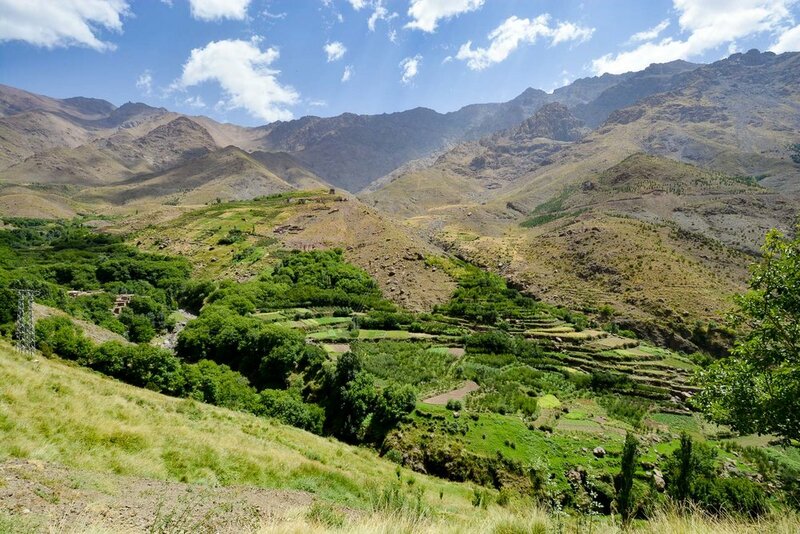 The waterfall was in Toubkal National Park. 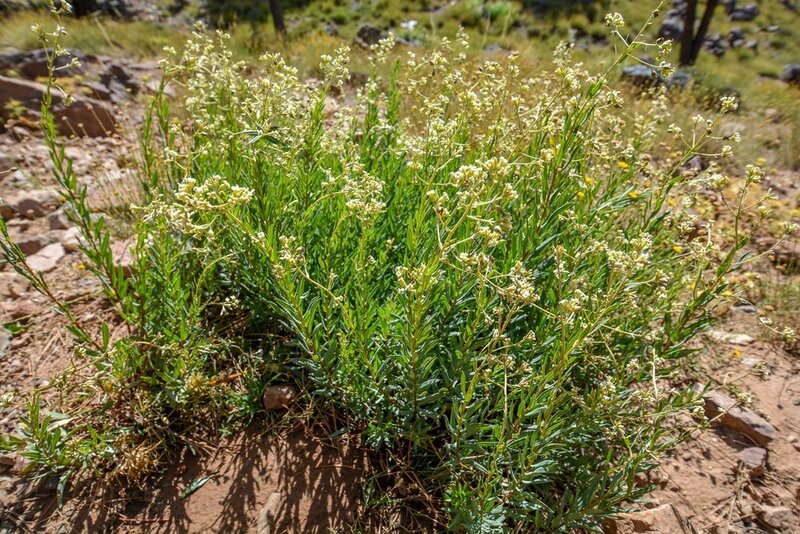 We hiked for an hour, up a mountain and then down into a dry river bed, then past some goat farms, and finally onto the loose rocks of the National Park. I had done well up to that point with not falling, but my legs were so tired at that point I slipped and fell up and down that park getting to the waterfall. Because we were there at peak dry season, it wasn’t as majestic, but it was still impressive considering how dry the rest of the river beds in the area were. Ali said during the winter there would be icicles cascading down. We took pictures and headed back. Passing by the goat farms again we saw two baby goats stuck on a large boulder. Ali went to catch one and both Bryan and I held him. He was so cute! His teeth were little nubs, he couldn’t even hurt us with a bite. 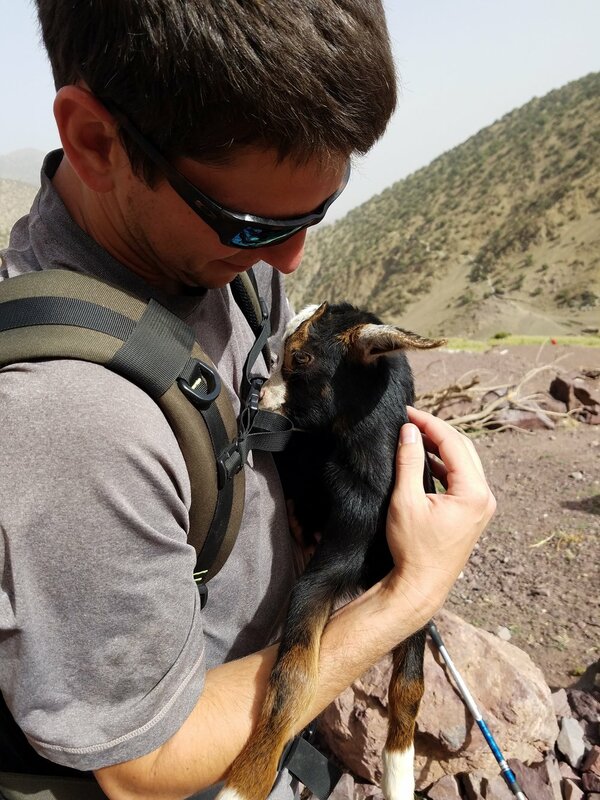 When Bryan was holding him, the goat started gnawing on his backpack straps, but was unsuccessful in eating it. The mountain pass we then had to do was the toughest climb of the entire trip. It wasn’t particularly steep like the second day. This was tough because of how long the climb was in addition to how tired and hungry we were. It took us almost 3 hours to summit. Ali let us take a short break at the top, and we ate some nut mix and bought some fresh squeezed orange juice at the snack stand set up at the top. We then inched our way down to the valley. It took about an hour, and I had to fully concentrate on not sliding down the mountain on loose gravel. Lunch was salad, egg tagine, and oranges & apples for dessert. It wasn’t until we were about to eat dessert we noticed Mohommad washing his cutting board, knife, and the apples & oranges in the stream. The same stream we had walked along on the descent, passing goat farms. We knew instantly that we were getting food poisoning, and the worst of it was probably coming soon. I barely ate. Bryan kept telling me to eat more, but all I wanted to do was sleep. It felt like my body was shutting down. 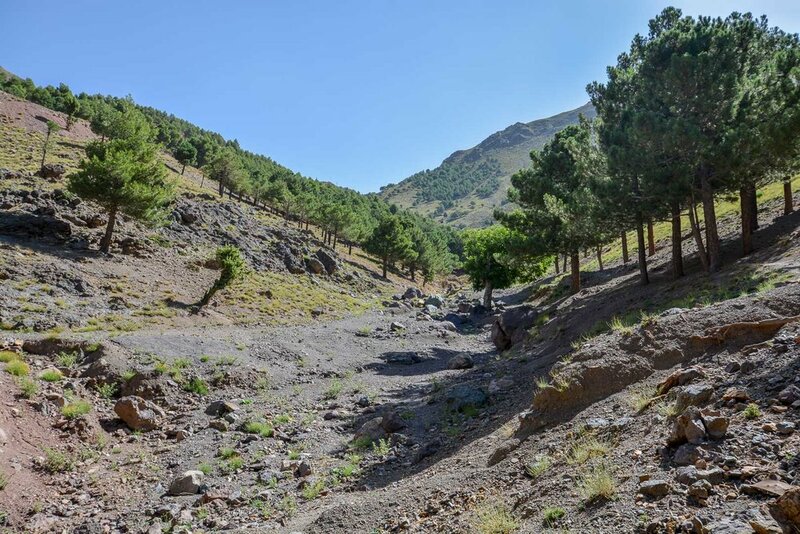 We had about an hour left of hiking before we got back to our hotel in Imlil. About 20 minutes away from the hotel, I begged Ali for a break. He let me stop for some water, and then took my backpack. When we got to the hotel, we said goodbye to Ali and Mohommad, thanked them for guiding us, and went to our hotel room and slept. My whole body hurt. My feet were filled with blisters around the toes, my legs felt like two concrete blocks, my back was sore, my shoulders felt like they were bruised from my backpack, the back of my neck felt sunburnt, I had a stomachache, my knees ached, I had a headache from low blood sugar, had the runs, and felt cold. I slept the entire rest of the afternoon. Bryan at dinner alone and brought in his dessert to try and get me to eat. I had a little banana and melon. The hotel manager, Mohommad, had heard of my stomach issues and brought us some fresh thyme tea. Bryan was sore as well, but he handled it better than I did. I slept straight until morning. The next morning I felt so much better, like a new person! I wasn’t even sore anymore. We packed up after breakfast, checked out, and walked to taxi stand to get a taxi to the Marrakech bus station. Reflecting on our experience, I think although I was in a ton of pain, the hike was worth it. 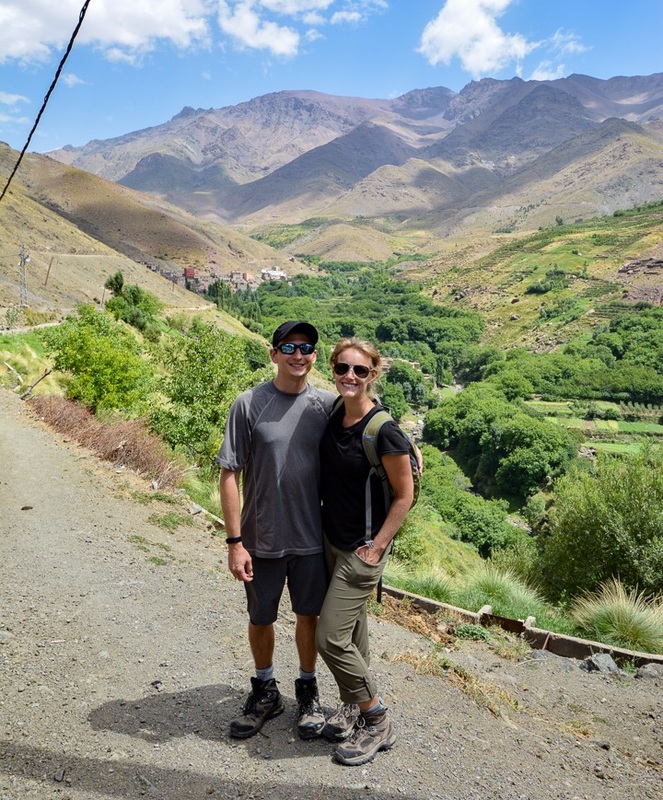 Bryan and I got a chance to immerse ourselves into Berber life, which few other tourists have the opportunity to do. 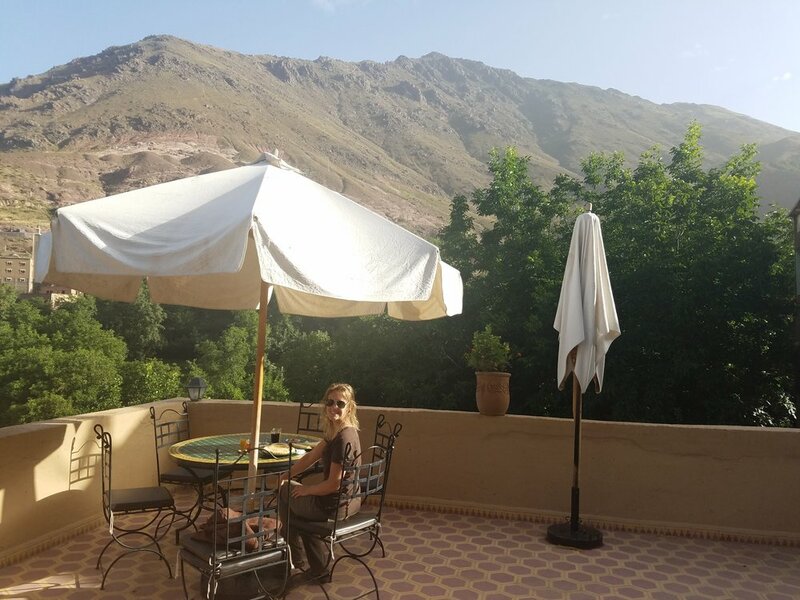 The Atlas Mountains gave us a much-needed break from flat desert land, hot weather, and the chaos of the cities.